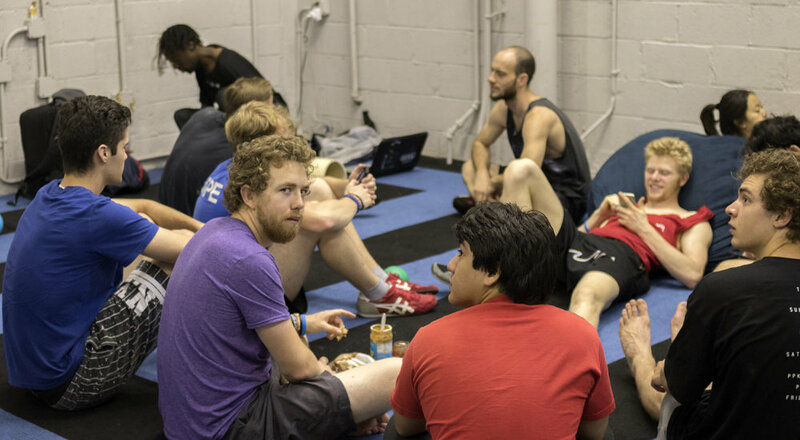 Want to know whats currently going on in the parkour world? As we near the end of summer and beginning of fall, we also enter the season of the some of the biggest competitions in our sport. Two of the most well known competitions are the North American Parkour Championships(1)(NAPC) and the Red Bull Art of Motion(2) (AoM). NAPC, hosted in Vancouver at Origins Parkour, pits competitors against one another in three separate events: the point based skill competition in which athletes attempt to perform the cleanest runs with predefined requirements, the time based speed competition in which athletes clear a number of checkpoints in the lowest amount of time possible, the point based freestyle competition in which athletes create their own runs in a specified area, ending in a biggest trick showdown between the top three athletes. AoM is a purely freestyle competition hosted by Red Bull that takes place in Santorini, Greece. The goal is to descend from the top of the course across various rooftops to a designated finish line at the bottom of the course in a limited amount of time. Competitors are judged on creativity, flow, difficulty, execution, and overall performance. Art of Motion has been running for a decade and has become the most popular free-running event in the world by far. Many athletes participate in the event, be it in person, creating a video for the online qualifier(3), voting in said qualifier, or by watching the stream online. However, there is a large population of athletes that is absolutely opposed to competition in parkour in any form, adopting the mantra “Run Without Rivals”. These athletes actively boycott these events, believing that parkour is based upon intrinsic motivation, not rivalry, and that competition undermines the cooperative and familial aspects that are so fundamental to parkour philosophy, specifically that “... [competition] stands against the philosophy of parkour to compete to win or earn anything that is not part of parkour values, such as medals, prizes, trophies, money, fame, recognition, or glory.”(4) While these views have merit, they reflect an overly optimistic view of parkour and an overly pessimistic view of competition. Both are simply unrealistic extremes that reflect the outdated and in some ways dishonest ideals of an undeveloped discipline with a very small community. Try to imagine a world with no Olympic games, no national sport leagues, or general competitive leagues in any sport/game/discipline. Would the world have ever seen the 3:43 mile(5), the 1102 pound dead-lift(6), or the 12’3” broad jump(7)? Would there be any professional athletes? The answer is not certain, but there is certainly a strong indication that athletes that compete are more motivated to reach beyond what was once thought to be impossible. “When people push their own limits, they inspire the people around them and ultimately, they end up pushing the limits of the sport as a whole. This is not only true for sport, but also for intellectual and artistic domains such as chess, academics, business, dance, music, and the list goes on.”(8) The phrase “A rising tide lifts all ships” comes to mind; the competition between athletes creates a higher standard for their sport which fellow athletes strive to attain thusly. Why, then, should parkour be any different? Maybe the real issue lies within the competitions’ formats themselves rather than the concept of competition. Maybe the parkour community should consider creating a new format that pushes people to be the best they can be while preventing people from being alienated and encouraging athletes to work together while maintaining a strong sense of community. A good format achieves objective judging, pits the athlete versus the course, and offers a variety of movements. The issue with speed courses is that though they are very objective and excellent pressure testing, they create situations where there’s a best move and the tallest guy that can stride the biggest just wins, which makes it difficult to incorporate the varied styles of parkour. Style competitions like AoM encourage individual style but suffer from the subjectivity of judges. Gymnastics excels in strict and objective judging, but doesn’t offer the same freedom as style competitions. Maybe parkour could benefit from formats akin to rock climbing and bouldering. These formats offer greater freedom where athletes have the option to choose routes that are more similar to their skill-sets which encourages participants to pursue their individual style. This can put athletes with completely different styles in exactly the same league as one another. The currently popular formats are not inherently bad, however they do not appropriately represent the whole of parkour by any measure. They encapsulate exactly what they are and do so very well, however as a whole, parkour is so much more than just skill, speed, or style. What do you think about the current formats? If you could create your own, what would your competition format be? Max Henry has spent years compiling information for the 180+ page book The Parkour Roadmap with thousands of hours of side routes and linked information to go along with it, this book is the ultimate guide to parkour from any perspective. Lessons From Other Actions Sports. An excellent video and research done by Damien Puddle about what FIG could do to Parkour.